Copper is an essential trace element that is vital to the health of humans for the proper functioning of organs and metabolic processes. It is necessary for proper growth, development, maintenance of bone, connective tissue, brain, heart, and many other body organs. Copper is also involved in the formation of red blood cells, the absorption and utilization of iron, the metabolism of cholesterol and glucose, and the synthesis and release of life-sustaining proteins and enzymes. These enzymes in turn produce cellular energy and regulate nerve transmission, blood clotting, and oxygen transport. 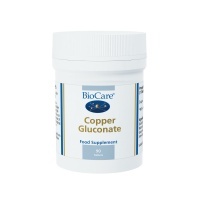 BioCare Copper Gluconate helps the body utilise iron to form haemoglobin in the blood & is involved in energy production.